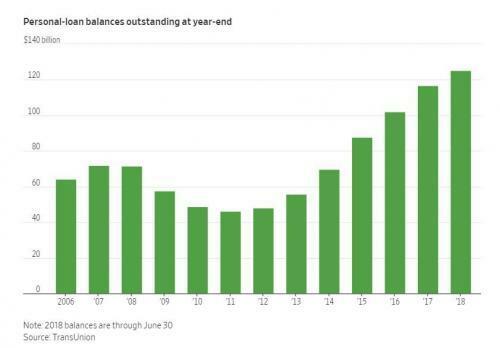 As lenders stretch to find ways to lend more money and boost interest income in a time of rising funding costs, and as borrowers continue to overextend themselves, risky unsecured personal loans are soaring in popularity. According to the WSJ, companies like American Express, Lending Club and even Goldman Sachs are heading a charge of offering unsecured personal loans at a record pace. In the first half of this year, it was reported that these lenders mailed a record 1.26 billion solicitations for these types of loans - and the second quarter marked the first time lenders mailed out more solicitations for these loans than for credit cards. Credit cards are an overwhelmingly larger business. With many ordinary middle-class Americans increasingly seeing the inflation adjusted incomes declining, it is hardly a surprise that the market for these loans is growing extraordinarily quickly: $81.9 billion in unsecured loans were extended during the first half of this year, a 13% rise according to data provided by Experian. This growth rate is outpacing most other forms of new debt: auto loans and leases, for instance, rose 9% over the same period of time. The total size of the market is now just over $120 billion, or nearly double the peak reached during the financial crisis. As the economy continues its "boom" and we push further into a decade long credit cycle, lenders are starting to bear more risk and dole out these types of loans to less creditworthy individuals to try and keep interest payments coming in. This report follows a an article we wrote just two days ago, noting that demand for commercial and industrial loans had suddenly tumbled. 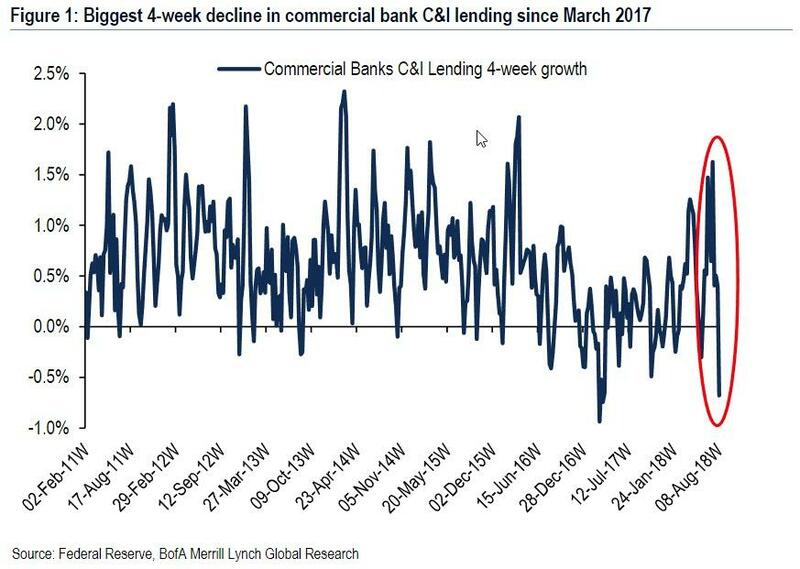 After a period of surprisingly strong growth following the near contraction in early 2017, commercial bank C&I lending tumbled during the period July 11th to August 8th by $15bn, or 0.68% - the biggest 4-week decline since March 2017 and before that the aftermath of the financial crisis. To maintain the loan growth, lenders are now skipping corporations and enticing individual consumers with personal loans by telling them they can use them to pay off additional debt, perform housing renovations or to "take a trip" as Barclays is pitches in one of their offers. Of course, these loans - traditionally the last bastion in the loan expansion race - are the riskiest to the lender because they are unsecured and borrowers have little collateral to begin with. This is one of the reasons these loans were so unpopular heading into the financial crisis. Cherie and Harry Young of Cromwell, Conn., took out a $60,000 personal loan late last year from LightStream, a division of SunTrust Banks Inc., for a home remodeling. They have seven years to pay it back at 7% interest. The couple have racked up extra credit-card debt since then because they also used cards to pay for some of the renovation, and Mr. Young was briefly out of work. Ms. Young said they preferred to use their cards rather than burn through their cash, and she is confident they will pay down their debt. American Express, Barclays and SLM Corp. , better known as Sallie Mae, have all made recent forays into personal loans. Citigroup Inc. and BBVA Compass ramped up their mailed offers this year, according to Competiscan and Mintel Comperemedia. Goldman launched personal loans in 2016 and was the fourth-largest solicitor of these loans during the first half of the year, according to Competiscan. “Pay off your high-interest credit card debt,” reads one offer from Goldman’s online lender, Marcus. Online lender LendingClub said this month it would launch a mass-market advertising campaign, even though applications from prospective borrowers hit a record in the second quarter. The company is considering new features, such as using the title to borrowers’ cars as collateral in order to approve prospective applicants that it would have previously denied. Predictably, as the market for cheap, easy personal loans, explodes, borrowers are rapidly falling behind in their payments according TransUnion. Meanwhile, more and more lenders are reporting increasing losses because as competition intensifies among all the new entrants to the space, the credit quality of borrowers continues to decline. Last year, 1.5 million loans of this variety were given to people with deep subprime credit scores of less than 601. This is generally known to be extremely poor credit, with . To make matters worse, applicants are starting to abuse the system, often signing up for several personal loans at the same time, and ending up with more debt than they can afford. And due to the lack of due diligence, lenders fail to notice additional recent loans that a borrower has taken on because credit reports haven't updated yet. The market is “clearly frothy right now,” Chief Executive of Discover Financial Services, David Nelms, told the Wall Street Journal. But more than just frothy: it's a carbon copy of what happened during the peak of the last credit bubble, only instead of personal loans, most households would gamble with mortgages. After all, the US housing market "had never gone down." But whereas back then banks could at least seize the house as collateral when the defaults started rolling in, this time they have zero recourse. The only silver lining: the size of the market remains relatively modest, for now.